What Can Be Put in a Mylar Bag for Food Storage? For How Long Does Boxed Dry Rice Last? Dry beans harden over time but remain edible for years. 1 What Can Be Put in a Mylar Bag for Food Storage? 2 For How Long Does Boxed Dry Rice Last? Dry foods make long term storage easier. They're a popular choice for people who want to preserve the bounty from their gardens, as well as for those who are worried about potential emergencies. These foods have a long shelf life if they are stored correctly. Dry food doesn't keep forever, though. Maintaining the right conditions and checking your pantry regularly is the best way to make sure that your dry goods are fresh and edible when you need them. Grains and legumes are among the most common dry foods. Stored whole in hermetically sealed conditions, soft grains like barley and oats last for about eight years. Hard grains like corn, wheat, white rice and millet keep for 10 to 12 years, but brown rice spoils within six months to two years. Grains keep less well in the form of flour or pasta. You can expect hermetically sealed packages of flour to last for five years, while pasta usually keeps for about eight. 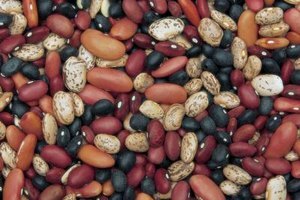 Whole dry beans can be stored for 8 to 10 years with no problems, though they become harder as they age. If you do not have access to hermetically sealed packaging, storage times decline to a year or two. Dried fruits and vegetables provide important nutrients in the event of an emergency. They also help liven up winter cooking and allow you to keep the harvest from your garden for months after picking. Dried vegetables keep for around 8 to 10 years in hermetically sealed containers or three to six months in ordinary containers. Dried fruit stays edible for only about five years when hermetically sealed, but for six months to a year in bags or jars. Powdered milk and other dried dairy products offer non-perishable alternatives to fresh dairy. They work especially well for baking and cooking. In a sealed, oxygen-free environment, dried dairy products stay good for up to 15 years. In more conventional storage, they keep for between three months and five years. Colder temperatures will help your dried dairy products stay fresh. Sweeteners like sugar and honey have very long shelf lives if they are kept away from moisture and other contaminants. While pure honey will tend to crystallize with long storage, it will keep indefinitely under good conditions, as will most sugars. Heat, light and moisture can all shorten the shelf life of dry food. If your dry goods come into contact with high humidity, they can grow mold or degrade very quickly. Dry food loses nutrients when exposed to light, making dark or opaque containers essential. Keep your dry goods away from heat sources like ovens, stoves or appliance exhaust ports. Cold, dry conditions promote longer shelf lives. How Long Can Food Stored in Canning Jars Stay Good?